A Japanese man, who bought a cheeseburger at McDonald’s, found 5-milimeter-long metal chips in his meal, local media reported. It comes hot on the heels of a string of incidents, including plastic in chicken nuggets and a tooth in potatoes. 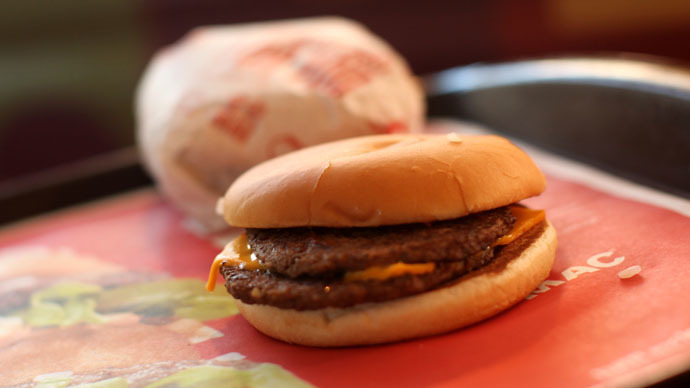 A Fukushima resident bought a cheeseburger at McDonald’s on January 1, Japan’s NHK TV-channel reported. He took it home - only to find metal chips inside what the company’s employees believed to be a part of a badly polished fire-pan surface. The customer reportedly suffered no damage. He called the restaurant to complain about the presence of a foreign body in the food item. Lately there has been a string of incidents connected with the fast food giant’s Japanese branch. Two restaurants have sold chicken nuggets containing plastic, and a human tooth was found in French fries, as well as pieces of napkins – in juice. Last Wednesday, McDonald’s Japan apologized for the recent incidents. Aoki called the incidents "isolated" cases and declined to give an overall tally of the incidents. McDonald's runs over 3,000 restaurants in Japan.